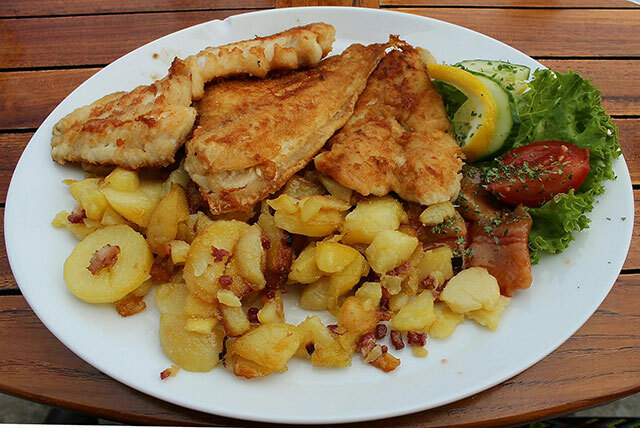 Combine flour, paprika, salt and pepper in a bowl or container that will fit the pickerel. Preheat a frying pan on medium-high heat. Add the oil. Coat the fillets in the flour mixture and fry till golden brown on both sides (about 2 to 3 minutes on each side). Remove from pan and place on paper towel until they are all done. If it is too dry, you may need to add more oil for the additional fillets. When all fillets are cooked, pour the wine and the lemon juice into the same pan to deglaze it and take advantage of all the flavor in the pan. Allow the liquid to reduce a bit (about 3 or 4 minutes) and add the chopped herbs and then the cold butter. Remove from direct heat and swirl the pan until the butter melts and incorporates with the wine, lemon juice and herbs. Put the fillets on the plates and pour some of the sauce onto each fillet. The fish and the sauce should be done at the last possible minute, so make sure any side dishes such as rice or vegetables are done or very close to it already.